On & For Production is conceived as a specific context for artists to share film projects in development in order to get conceptual and strategic feedback and to find co-producers. It is also an occasion for organisations, professionals and artists who have a consolidated expertise in artistic film production, to share, discuss and disseminate different modes of operating. Each work-session lasted two hours and was dedicated to a film project in development. The project was presented by the artists and the producer, in order to be discussed with a group of professionals that had been especially invited to attend that specific session on the basis of their potential complicity and engagement with the project. Labour Power Plant by Romana Schmalisch & Robert Schlischt (producers: Laboratoires d’Aubervillers and Spectre Productions, FR). Sven Augustijnen (artist, BE), Bernard Blistène (Centre Pompidou, FR), Will Bradley (Kunsthall Oslo, NO), Emilie Bujès (Independent curator, FR/CH), Pascale Cassagnau (CNAP, FR), Isabel Carlos (Gulbenkian Foundation, PT), Benjamin Cook (LUX, GB), Fréderic De Goldschmidt (private collector, BE) Kate Gray (Collective Gallery, GB), Zoe Gray (independent curator, GB), Sophie Goltz (NBK, DE), Krist Gruijthuijsen (Grazer Kunstverein, AT/NL), Helena Kritis (Beursschouwburg, BE), Jean-Conrad & Isabelle Lemaître (private collectors, FR), Andrea Lissoni (Tate Modern, GB), Marie Logie (Auguste Orts, BE), Frank Maes (Emergent, BE), Francesco Manacorda (Tate Liverpool, GB), Anna Manubens (Auguste Orts, BE), Olivier Marboeuf (Spectre/Khiasma, FR), Noor Mertens (Museum Boijmans Van Beuningen, NL), Mihnea Mircan (Extra City, BE), Jan Mot (Jan Mot, BE), Steven Op de Beeck (Contour, BE), Maria Palacios Cruz (independent writer and curator, GB), Rolf Quaghebeur (Argos, BE), Christophe Slagmuylder (KFDA, BE), Romana Schmalisch (artist, DE), Robert Schlischt (artist, DE), Nicola Setari (Contour, BE/IT), Mike Sperlinger (independent curator, writer and producer, GB/NO), Philippe Van Cauteren (SMAK, BE), An van. Dienderen (artist, BE), Valerie Verhack (Museum M, BE), Mathilde Villeneuve (Les Laboratoires d’Aubervilliers, FR). The day after the work sessions, an open workshop was organised for artists, professionals and students working with moving image. The workshop was a moment of public debrief in which the experience of the work sessions was assessed in order to build a collective form of critique. It also touched on artists’ film production specificities and strategies in general. The workshop was chaired by María Palacios Cruz and included the participation of the four artists (Sven Augustijnen (BE), Beatrice Gibson (GB), Robert Schlicht / Romana Schmalisch (DE) and An Van. 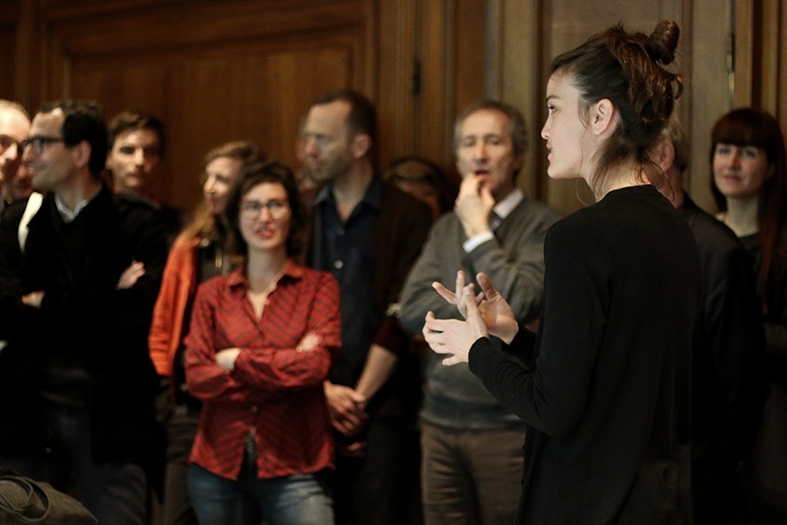 Dienderen (BE)) and their producers (Marie Logie and Anna Manubens – Auguste Orts; Ben Cook – LUX; Mike Sperlinger- curator, writer and producer; Mathilde Villeneuve – Les Laboratoires d’Aubervilliers; Olivier Marboeuf – Khiasma and Spectre Productions; Steven Op de Beeck – Contour Biennial). Acquiring film and video: How/What do we own? Artists’ films are ubiquitous. They exist as limited editions for private and public collecting while having distribution rights for cinema rooms and exhibition spaces. The same film can be in any of those places at the same time. The entrance of audio-visual works in the art market significantly contributed to the overcoming of fetishism and out-dated nostalgia towards the original. However, their current existence across the regimes of art and cinema –with their differentiated value systems and dissemination modes– is pushing for further reassessment of what is at stake in collecting all together. Does “property” means privatising the rights? Is “owning” key when collecting? Could artists’ films contribute to rethinking the value of collecting? Speakers: Haro Cumbusyan (Collectorspace, New York / Istanbul), Andrea Lissoni (TATE Modern, London), Chris Hammond (Director MOT International, London / Brussels), Beatrice Gibson (Artist, London) & Ben Cook (LUX, London). By María Palacios Cruz available here.